Lowdown: An undistinguished toilet cleaner girl turns out to be the queen of the earth. The job of a reviewer is a tough one. Sure, we enjoy analysing good movies; we can even derive significant pleasure dissecting exactly where inherently bad movies are failing us (as has recently been the case with American Sniper). However, from time to time we are required to divest our brains into discussing films amounting to nothing, worthless stuff for which any further investment of resources represents sunk costs. Case in point: Jupiter Ascending. 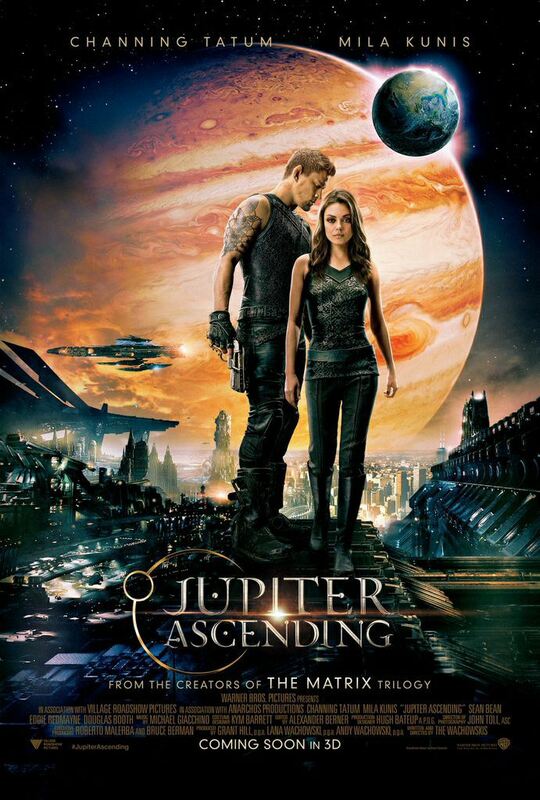 Brought to was by Lana and Andy Wachowski, otherwise knows as The Wachowskis, or even more better known as the brains behind The Matrix, Jupiter Ascending follows up on their well established themes. We’re talking science fiction / fantasy, we’re talking new age philosophies, we’re talking stunning visuals and heavy reliance on visual effects. Personally, I think the pair had peaked with Speed Racer, a movie devoid of the nonsense at the core of The Matrix (human batteries?) as well as the two redundant sequels. Sadly, Cloud Atlas proved the pair unable to maintain peak production. And now Jupiter Ascending takes them to never before explored depths. Pretty much the only positive to put against Jupiter Ascending lies with its central character, Jupiter (Mila Kunis), being female, thus totally bucking the Hollywood trend. Born in Russia, her father was murdered in weird circumstances and her family migrated to Chicago where they now all work as undistinguished house cleaners. Little do they, and the rest of us earthlings, know about our planet’s true nature. If The Matrix had us powering the machines, Jupiter Ascending has us as the [still very inefficient] output of a factory run by a prince of an interplanetary royal family (Eddie Redmayne) from the depths of planet Jupiter. In a very fatalistic kind of a way, our Jupiter turns out to be more than a toilet cleaner in this universal equation, which has our royals doing their best to harm her. Luckily for her, she’ll get the assistance of non earthy defenders (a Channing Tatum providing the male half of the romantic equation, as well as a Sean Bean with a life expectancy far surpassing the average Sean Bean in a movie life expectancy). Lots of fighting occurs, spectacular visuals and special effects fill the screen, and in the end we have ourselves a terribly predictable and mundane affair that simply cannot be rescued by the way-above-average special effects budget. Mundane-ness and predictability are best interrupted by things not really making sense, that, for their part, are interrupted by overlong bouts of incoherent dialog (what fiendish apocalypse befell upon Redmayne’s vocal cords?). Those aside, there is nothing particularly original about Jupiter Ascending. As already alluded, we have motifs heavily borrowed from The Matrix. The design and looks department heavily borrows from Dune the movie, while the whole royal nature of a universe driven by feuding royalties scrapping for heavenly resources is heavily reliant on Dune the book. Even the eighties cult movie Flash Gordon serves for inspiration here on more than one account. Overall: Mundane to the bone, Jupiter Ascending is simply nothing more than a time waster. A film so average it’s not even worth celebrating for its deficiencies. 1 out of 5 crabs that could have made much better use of its time watching paint dry.